How Many More Years Will Putin Occupy Ukraine? KIEV, Ukraine -- Two years ago today, February 27, Russia invaded Ukraine. On the heels of the Euromaidan Revolution and the vicious sniper attacks that killed 103 Ukrainians, Russian President Vladimir Putin saw an opportunity and ordered the military takeover of Crimea. 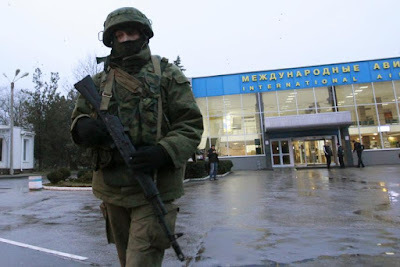 A Russian soldier patrols at the airport in Simferopol, Crimea, two years ago. The operation began when Russian military personnel, disguised as little green men in unmarked uniforms, and pro-Russian militia groups stormed government buildings in Crimea. The operation began when Russian military personnel, disguised as little green men in unmarked uniforms, and pro-Russian militia groups stormed government buildings in Crimea, including the parliament and the supreme court in Simferopol. Russian flags immediately replaced Ukrainian ones. Within forty-eight hours, Russian special forces seized Crimea’s airports. By March 2, the Russian military, operating from its base in Sevastopol and buttressed by heavily armed troops arriving by air from Russia, had swiftly taken over the entire peninsula. The Ukrainian government, still shell shocked by former President Viktor Yanukovych’s sudden ouster and advised by Western allies, ordered Ukrainian military personnel stationed in Crimea to stand down. The Kremlin threatened Kiev with full-scale war if it resisted. However, Ukraine’s concession was not enough to satiate Putin, who wanted economic and political control over Ukraine. As Russia annexed Crimea after a fraudulent referendum on March 16, little green men also began to appear in the Donbass. Russian troops and equipment poured into Ukraine’s east. This time, the Ukrainian government had no choice but to respond militarily to stop the invasion of mainland Ukraine. Two years later, the Kremlin-manufactured war in Ukraine has cost 10,000 Ukrainian lives, displaced more than 1.6 million and turned what was once the heart of the country’s industrial base into an economic wasteland. Russia and its proxies now occupy 9 percent of Ukrainian territory. Russia’s actions in Crimea revised European borders for the first time since World War II and broke numerous international treaties, including the 1994 Budapest Memorandum in which Russia, the United States and the United Kingdom agreed to respect the territorial integrity and political sovereignty of Ukraine. In exchange for this guarantee, Ukraine gave up its significant nuclear arsenal. The West responded to Putin’s aggression by imposing economic sanctions on Russian officials, businessmen with close ties to the Kremlin and their businesses. These measures have limited Russian banks’ access to much-needed Western credit. With oil prices remaining stubbornly low, the Russian economy, which is projected to contract by three to four percent in 2016, is feeling the pain. Sanctions must remain in place until Ukraine controls its eastern border and Russia no longer occupies Crimea. Despite a growing chorus of pro-Putin voices in Europe, the EU must remain steadfast in its commitment to sanctions until the Minsk agreements are fully implemented and Russia withdraws its troops from Ukraine. But the West still needs to do more to counter the Russian narrative. Western leaders have shied away from calling the Kremlin’s annexation of Crimea and war in the Donbass what it is: an invasion and occupation of a sovereign nation. While intervention or action may sound more diplomatic, they are nothing more than euphemisms that misrepresent the reality on the ground. Putin himself has publicly admitted and even boasted about the efficiency of Russia’s military takeover of Crimea—outlining, in methodical detail, the invasion. He has also admitted that Russian soldiers are in the Donbass. It is time that European and US policy makers and Western media take Putin at his word and call a spade a spade. Euphemisms only play into the Kremlin’s version of events, undermine the international community’s unity against Moscow’s aggression, and make it harder to formulate a coherent Western policy against the Kremlin’s revisionist ambitions.